The Michigan State University Student Housing Cooperative in East Lansing, MI, is seeking a part-time (25-35 hours per week) Financial Coordinator/Bookkeeper. Applications are due by March 2nd, 2016. For a job description and details on how to apply, visit this page. We are excited to welcome eight new directors to the NASCO Board. Four of them will be serving full three-year terms, while two will be serving two-year terms and two will be serving one-year terms. These shorter terms are filling the remainders of terms that were vacated by board member resignations. NASCO's Cooperative Internship Network is officially accepting host applications for 2016 internship positions, due by Sunday, February 28th! Whatever the size or type of your organization, we encourage you to take part in this opportunity to expand your support team. The NASCO Cooperative Internship Network allows cooperatives and other organizations to directly market internships to cooperative youth through NASCO's membership and networks without the hassle of a traditional intern hiring process. Visit this page for more information, or join us for an Information Session on February 3rd or 12th. If you have any questions, contact Morgan Crawford at morgan@nasco.coop. The NASCO Staff & Managers Conference will take place in Boulder, Colorado on April 27-28, 2016. A full event program and registration details will be posted on our website in early 2016. This conference is a cooperative education and training program that is designed specifically to meet the needs of staff and managers of campus-based housing cooperatives. The conference serves as a collective learning forum that strives to empower campus co-op managers from across Canada and the United States. Conference participants share ideas through workshops, discussions, and informal networking. Please direct questions to: morgan@nasco.coop. Across the country students, faculty, staff and communities are organizing Next System Teach-Ins because they're tired of the status quo and want to be part of building a new more equitable, democratic and sustainable future. It's only been a month since launching this initiative and already hundreds have signed up to take part and 12 official teach-ins are in the works with many more to come. From New York to Seattle, Detroit to Santa Barbara, communities are gearing up to explore system change and plot the next steps their community can take to deepen ties between existing projects and movements, as well as spark new initiatives based on each campus or community's needs. Recognizing that problems like mass incarceration, climate change, student debt and growing inequality are problems of system design, the Next System Teach-Ins will provide a forum for discussion, debate and community building around concrete, systemic solutions. The past year was a very exciting one for co-op development. There is currently a lot of interest in creating new cooperatives, and we’re happy that we have been able to increase our capacity to provide advice and support to more of these groups. 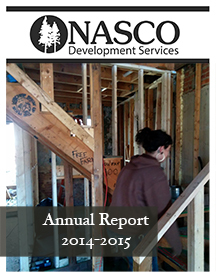 During the 2014-15 year, NASCO provided free technical assistance to over 30 groups and has worked with four groups to coordinate purchases. Over half of the groups we worked with were startup groups. The Genesee Valley Cooperative in Geneseo, NY was one startup group that we first met in the spring of 2013, when their members still lived in campus housing and “The Co-op” felt like a distant dream. They started renting their first property in the fall of 2014. We worked with GVC throughout the year to create member labor systems, bylaws, and plan for the future. In the fall of 2015, GVC was able to expand to renting a second building. Last month, we invited all supporters of NASCO to help create more co-ops, change the ways that cities think about affordable housing, and build the cooperative movement with our End of Year fundraising campaign. You all went above and beyond! We received donations from fifty individuals and raised a total of $6,240. We’re touched by this support, because of the large, diverse crowd of people that chose to make NASCO a priority in their lives: from NASCO founders and co-op newbies, members of co-ops, staff of co-ops, even from parents of people who used to live in a co-op. It's powerful when so many people join together. It tells us that there is a common element to all of our co-op experiences, and that we can work together to make a meaningful difference in each others' lives. Thank you very much for supporting our work, we’re going to continue doing great things together! We are pleased to announce that NASCO has been awarded two grants through the CHS Foundation’s 2016 Cooperative Education Grants Program. We have been generously awarded $10,000 to support NASCO’s annual Cooperative Education & Training Institute, and a $16,000 capacity building grant to grow NASCO's resource and program development capacity to more sustainable levels. We are extremely grateful for the continued support of the CHS Foundation and are excited for the many ways that this funding will strengthen our organization and our movement. The CHS Foundation is the major giving entity of CHS Inc. (NASDAQ: CHSCP), the nation's leading farmer-owned cooperative and a global energy, grains and foods company. As a part of the CHS stewardship focus, the CHS Foundation is committed to investing in the future of rural America, agriculture and cooperative business through education and leadership development. Vote for NASCO's Board of Directors! NASCO has seven open seats on its board, and all Active Members and Individual Members are able to vote in the election to fill these seats. All members have been sent ballots. If you did not receive yours, please contact rek@nasco.coop. The candidate statements can be read here. Ballots must be cast by January 31, 2016. California Co-op Conference, April 29-30, 2016, Sacramento, California. Proposals due January 12, 2016. Joint Conference of the Canadian Association for Studies in Co-operation (CASC) and the Association of Cooperative Educators (ACE), June 1-3, 2016, Calgary, Alberta. Proposals due January 15, 2016. CCMA: the National Conference for Food Co-ops, June 9-11, 2016, Amherst, Massachusetts. Proposals due January 15, 2016.